Greetings from sunny Florida! That’s what the box on the gift of oranges read. 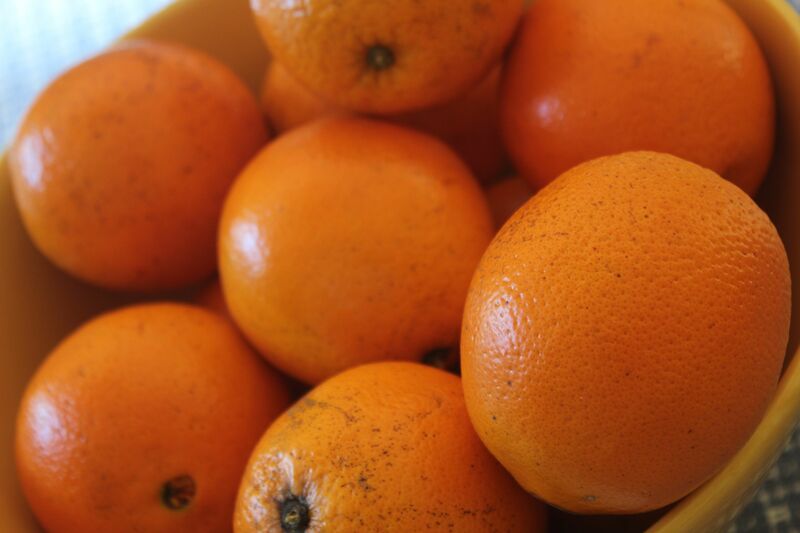 This gift has been excellent and came at the perfect time – while SensitiveHusband and I wait for the next snowstorm, we have been able to enjoy really fresh, juicy, delicious navel oranges! According to the Florida Department of Citrus, the Florida varieties that are currently in season include Temple Oranges, Honey Tangerines, Red Grapefruit, Pink Grapefruit, White Seedless Grapefruit, and Juice Oranges. Since the rainfall in Florida has been lighter than usual this year, the crop is estimated to be 142 million boxes, which is almost 5 million boxes fewer than the 2011-2012 season. According to Florida Citrus Mutual, the Florida citrus industry creates a $9 billion annual economic impact, employs almost 76,000 people, and covers about 550,000 acres. Last weekend I decided to get a little creative by figuring out how to bake with an orange. I took inspiration from a recipe for Orange Oatmeal Cookies and made a number of ingredient swaps and substitutions to remove the butter, cane sugar, cream of tartar (since I didn’t have any on hand), and reduce the gluten (although these could be made gluten free if you prefer by swapping the whole wheat flour out and replacing with brown rice or millet flour). 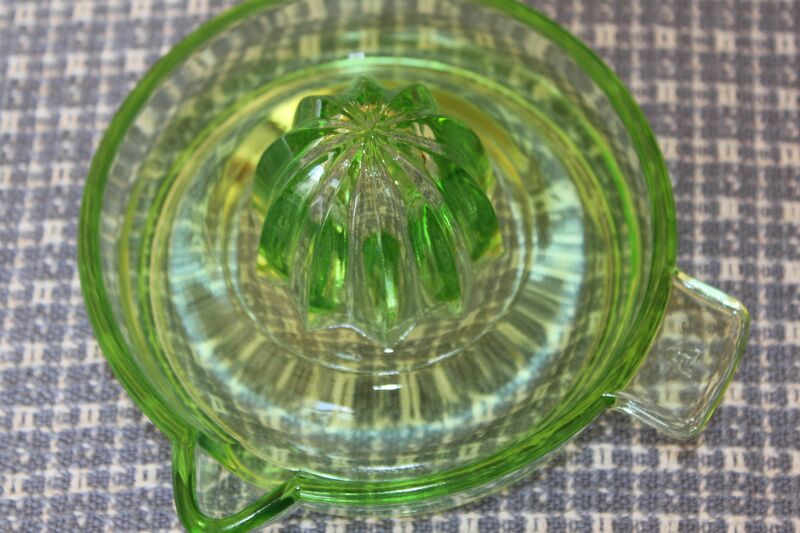 I also enjoyed using my great-grand-aunt’s green juicer, shown above. I pictured her laughing and smiling while I juiced the orange and made the cookie dough. 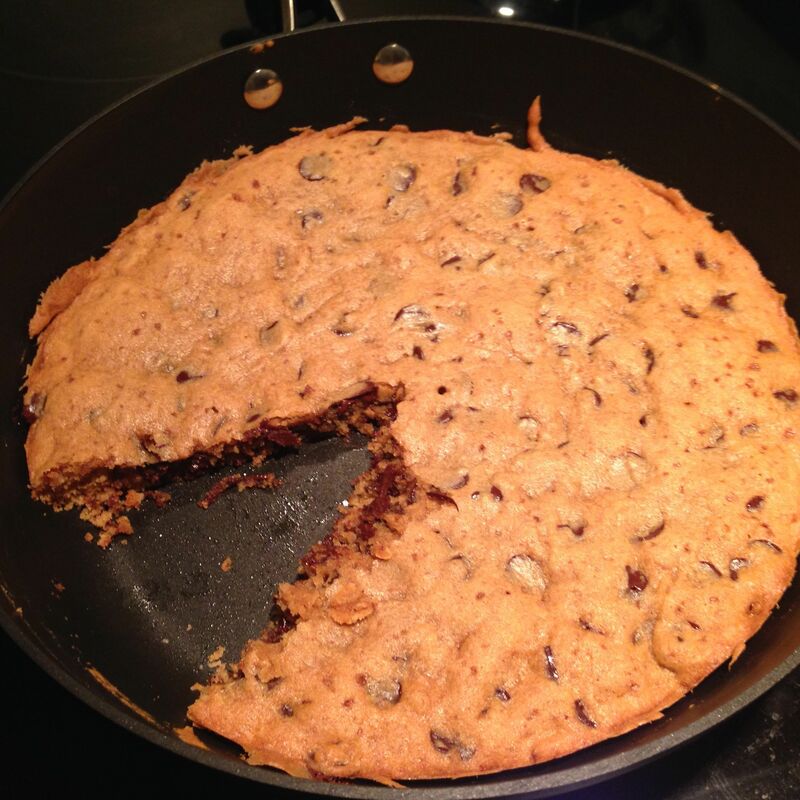 The result was a hearty and perky cookie that is delicious at any time of the day…even as a mid-morning snack! Whether you are enjoying a day at the beach or watching the snow fall (I am in the latter camp today), these cookies use ingredients that are easily obtained year-round. Mix together canola oil and maple syrup in a large bowl. Stir egg white and applesauce into mixture. Stir in orange juice with pulp and orange zest. Mix flours, oats, (optional) walnuts, baking powder, and cinnamon in a separate bowl; fold into the large bowl of wet ingredients until evenly incorporated. Drop by heaping tablespoon onto prepared baking sheets. Bake in preheated oven until bottom of cookies are lightly browned, 10 to 12 minutes. 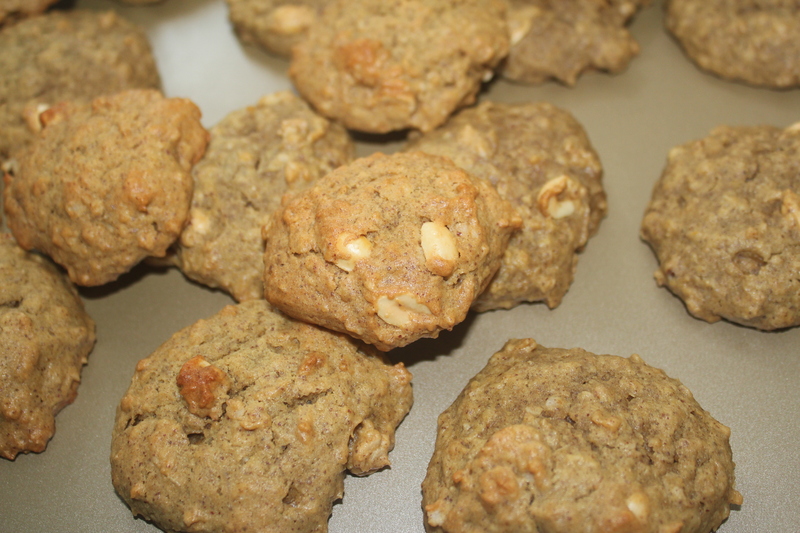 Peanut butter cookies are tasty, especially ones that combine a satisfying crunch with chewiness. You may ask, “how can that be done?” Well, my friends, you can have a chewy cookie with a satisfying crunch if you add toasted oats and nuts to a cookie batter. I was inspired by a Martha Stewart recipe for Nutty Butter Cookies. I decided to reduce the amount of butter used, so I substituted with some unsweetened applesauce. I also substituted the refined sugar with a combination of maple syrup and honey. For my nut butter, I selected peanut, although I think almond butter would work really well too. Fortunately this recipe does not call for much nut butter, since the prices of nut butters have increased substantially during the first half of this year. I hope that you enjoy this recipe! And if you have not yet done so, please visit my home page to vote for your favorite dessert flavor. Are you a chocoholic? Or do you prefer plain vanilla? Perhaps a refreshing mint or zesty lemon? Just click the button for your choice and click “vote” – and then you will see the results so far. Thanks for participating! Enjoy your day, and your cookies. Melt 1/2 stick butter in a medium saucepan over medium heat. Add oats and cook, stirring, until toasted, 5 to 7 minutes. Spread oat mixture on a parchment-lined baking sheet; let cool. Meanwhile, preheat oven to 350 degrees. Whisk together flour, baking soda, and 1 teaspoon salt. Beat together remaining 1/2 stick butter, applesauce, maple syrup and honey with a mixer on medium-high speed until fully combined. Add egg and beat until combined. Add nut butter, and beat on medium speed until well combined. Add oat mixture and chopped nuts, and beat on low speed until combined. Add flour mixture, and beat until combined. Place cookies, about a teaspoonful each, 1 inch apart on parchment-lined baking sheets. Bake until golden, 12 to 15 minutes. I am sharing my recipe with Simply Sugar and Gluten Free, Food Trip Friday, Cybele Pascal Allergen-Free Cooking and Sweet as Sugar Cookies. This week I have been celebrating my blog’s one year anniversary. It has been fun to think about all of the new foods I have tried and shared, and my favorite recipes that I have revised. 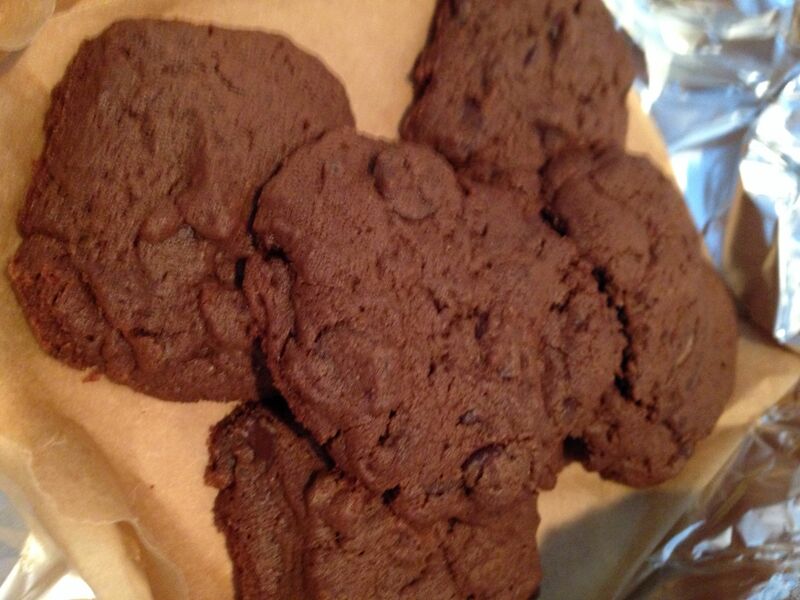 One year ago I posted my first recipe for chocolate chip cookies. It was a wonderful recipe that substituted the refined sugars with natural sweeteners. Since then I have made that recipe dozens of times because I like to have a steady supply of dessert in the house. 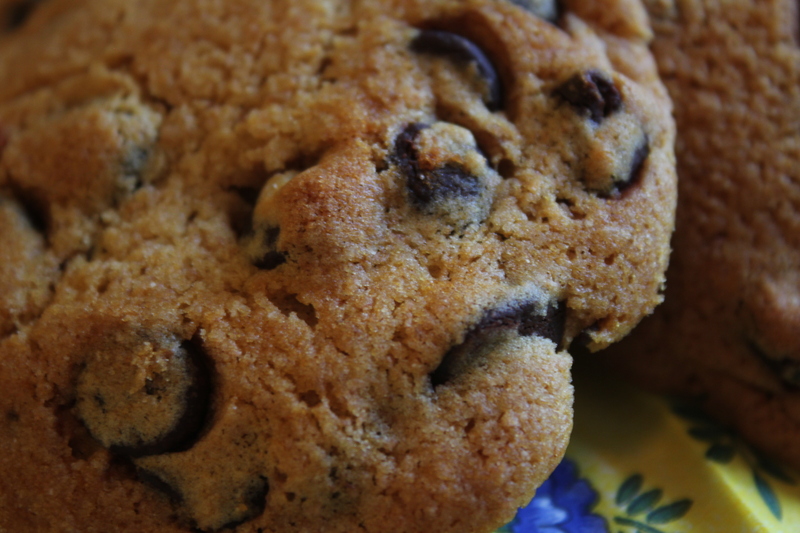 There is something quite nice about kicking back at the end of the day with a homemade cookie. At first I was only concerned with getting the refined sugars out of the cookies. Over the past year I have tinkered with the ingredients – how could I add nutrients? Reduce saturated fats? Reduce gluten? Make them fluffier? Well, I think I have managed to update last year’s version – I removed one stick of butter and added applesauce, used some oat flour to reduce the overall gluten amount, let the butter soften naturally for a lighter texture, used my own homemade vanilla extract for added flavor, and added some more chocolate chips (I really tested the last point thoroughly). I hope you enjoy this recipe. Have a nice day! Drop tablespoonfuls of batter onto ungreased cookie sheets. Bake at 375 degrees for 10-11 minutes. As I write this post, I am humming the tune of “Sleigh Ride” and watching the snow fall. And no, I am not at the North Pole! It has been a crazy October 29 here in the Northeast – the day started with the trees on full autumnal color display and is ending with a winter wonderland. What a wacky day! I have to keep reminding myself that Halloween is only two days away. In preparation for a Halloween potluck lunch on Monday, I baked some cookies today. 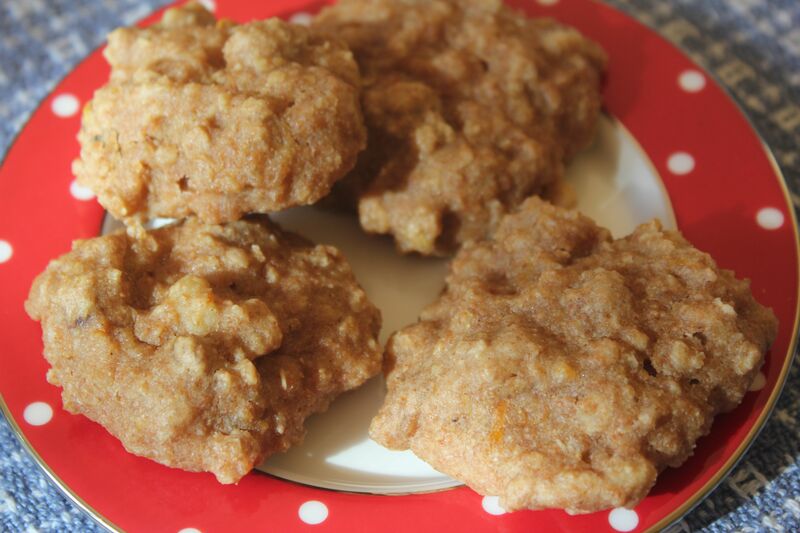 I was inspired by a recipe for Old-Fashioned Soft Pumpkin Cookies, and was especially impressed when the degree of difficulty was noted as “easy.” I played around with the ingredients, adding some whole wheat flour and substituting the refined sugar with honey. 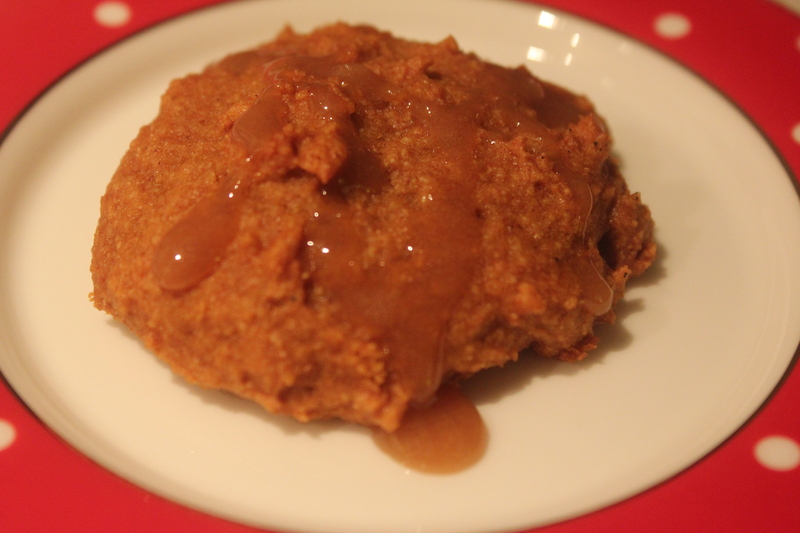 The result was a light and fluffy cookie…that really needed a sweet glaze topping. So I got out my saucepan and melted a few ingredients…into a sweet, yummy concoction. I drizzled the glaze onto the cookies and that looked much better. However, I had to try another one with the glaze just to make sure that they were good enough to bring to the potluck. I think that my coworkers will enjoy them…if the plate of cookies lasts until Monday! 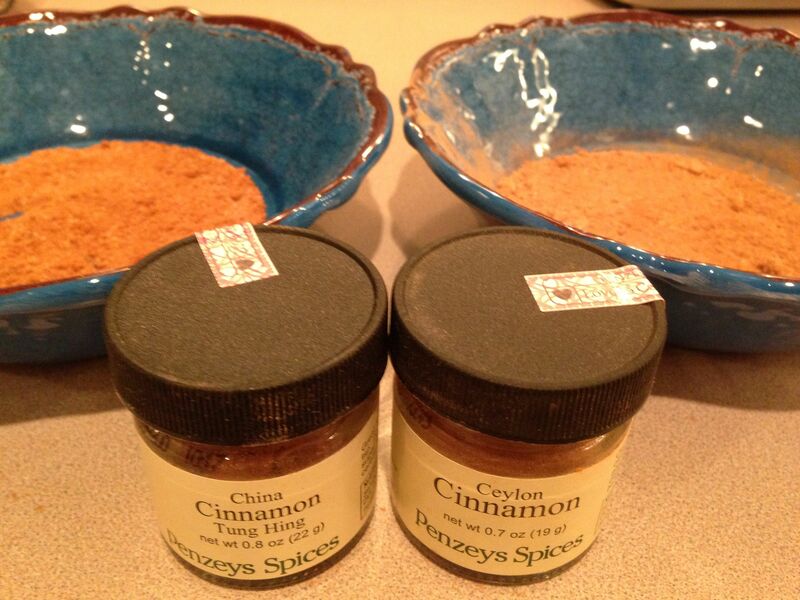 COMBINE flours, baking soda, baking powder, cinnamon, ginger (or nutmeg) and salt in medium bowl. Beat honey and butter in large mixer bowl until well blended. Beat in pumpkin, egg and vanilla extract until smooth. Gradually beat in flour mixture. 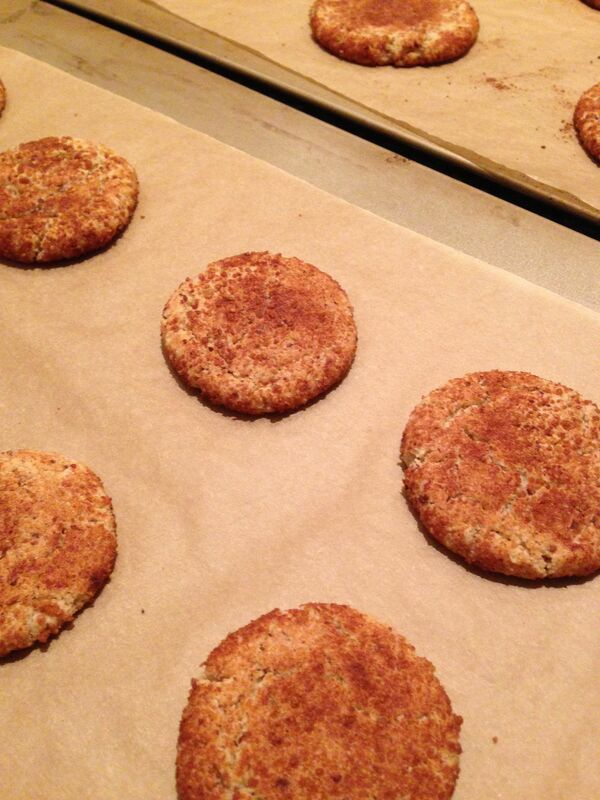 Drop by rounded tablespoon onto baking sheets. COMBINE 1/2 cup maple sugar, 1 tablespoon milk, 1 tablespoon melted butter, 1 tablespoon maple syrup and 1 teaspoon vanilla extract in small saucepan on low heat until smooth. Allow glaze to cool for a few minutes before drizzling on the cookies. I am sharing this recipe with Joy of Desserts, Simply Sugar and Gluten Free, Lady Behind the Curtain, Miz Helen’s Country Cottage, This Chick Cooks, Something Swanky, Food Trip Friday, Sweet as Sugar Cookies, Beauty and Bedlam and Everyday Sisters. Recently my aunt shared some family cookie recipes with me. They were all recipes of her grandmother and passed down to my grandmother, my aunt and now me. Last weekend as the temperatures cooled and the first feelings of autumn were in the air, I decided to try the recipe for Old-Fashioned Oatmeal Cookies. However, I gave the cookies a modern twist: I substituted the refined sugar with honey, substituted the solid shortening with canola oil, and reduced the amount of water. While I made the cookies, I felt a connection with my family – I really enjoyed making the same cookie that my aunt, grandmother, and great-grandmother made for themselves and their families over the years. The entire house smelled of cinnamon and raisins while the cookies baked. And the result was a light and chewy cookie that tasted delicious. I hope that you enjoy this old-fashioned recipe with a modern twist. Simmer raisins and water in a saucepan over medium heat until raisins are plump, about 15 minutes. While the raisins are simmering, mix all of the ingredients together in a large bowl. Add the raisins and a bit (about 1/4 cup) of the water from the saucepan into the bowl and mix together with all the ingredients. Spoon level tablespoonfuls of the batter onto greased cookie sheets and bake at 400 degrees for approximately 10 minutes. I am sharing this recipe with Joy of Desserts, Simply Sugar and Gluten Free, Balancing Beauty and Bedlam, This Chick Cooks, Lady Behind the Curtain, Miz Helen’s Country Cottage, Food Trip Friday, Sweet as Sugar Cookies and Joy of Desserts – Vintage Recipes. Quick! 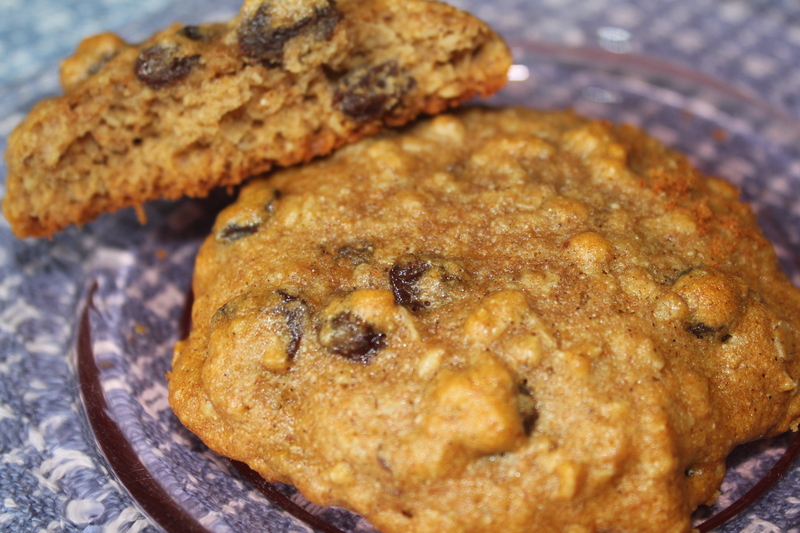 Make These Peanut Butter Chocolate Chip Cookies Before Prices Increase! According to the Chicago Sun-Times, the prices for peanuts and peanut butter are on the rise. The peanut supply is lower than normal due to two factors: (1) fewer peanuts were planted because farmers opted to grow more profitable cotton and corn, and (2) the prolonged high temperatures this summer adversely affected the peanut crop. Alabama, Florida, Georgia, Mississippi, New Mexico, North Carolina, South Carolina, Texas and Virginia produce the majority of the nation’s peanuts. According to the USDA, an extreme drought in Texas and Oklahoma has reduced the peanuts harvested. J.M. Smuckers, which makes JIF, has announced that the price of its peanut butter will increase 30% starting in November. Other peanut companies are likely to follow suit. So what should we do? 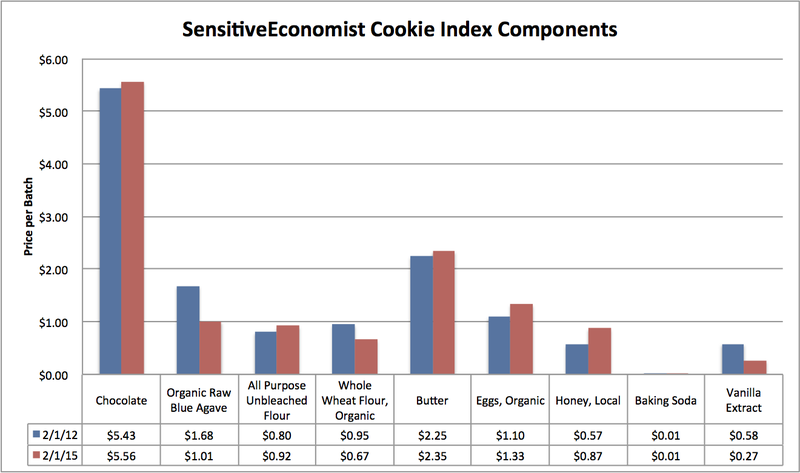 I say let’s bake, bake, bake…and fast before the prices rise. There are lots of peanut butter foods from which to choose – I have already shared recipes for Peanut Butter Cups, Honey Peanut Butter Frosting and Peanut Butter Chocolate Chip Brownies, and now I am happy to share a terrific recipe for Peanut Butter Chocolate Chip Cookies below. 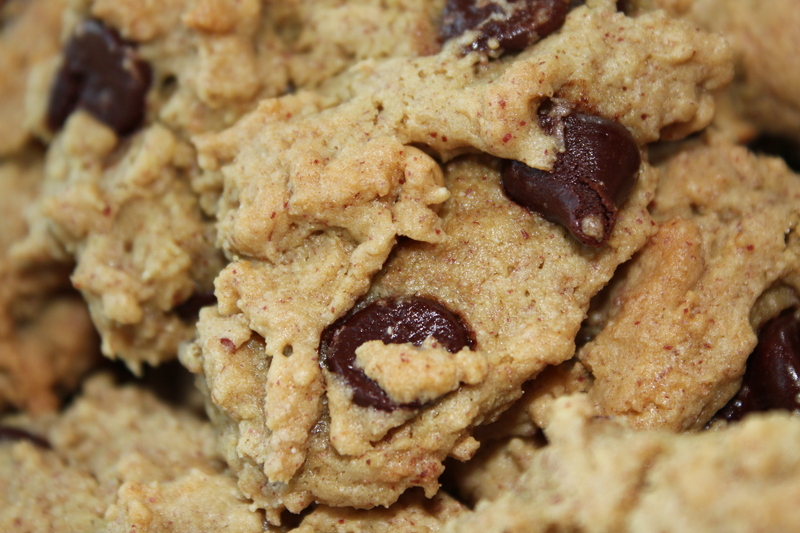 The recipe was inspired by Terry Walters’ Clean Food; I used whole wheat flour instead of teff and swapped grain-sweetened for semisweet chocolate chips. I plan on enjoying these delicious cookies often…and stocking up on peanut butter this month so I can keep baking them through the winter. Combine all dry ingredients in one bowl and all wet ingredients in another. Pour wet ingredients over dry and blend until just combined – do not overmix. Fold in chocolate chips. Drop batter by heaping teaspoons onto cookie sheet. Place in oven and bake 13 minutes or until lightly browned. Remove from oven and place directly on wire rack to cool. Makes approximately 20 cookies. I am sharing this recipe with Joy of Desserts, Simply Sugar and Gluten Free, Balancing Beauty and Bedlam, Lady Behind the Curtain, This Chick Cooks, Miz Helen’s Country Cottage, Food Trip Friday and Sweet as Sugar Cookies.